Problem: Another fine morning, SharePoint 2013 sites started displaying a message: "We apologize for any inconvenience, but we've made the site read only while we're making some improvements.". Same time, noticed a backup failure E-mail from the backup software! 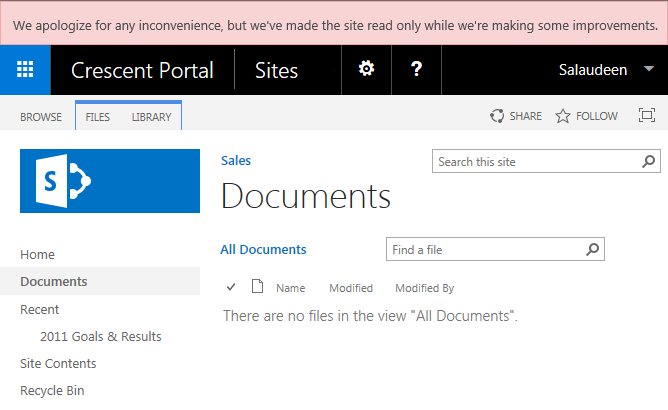 Since the Backup failure occurred, SharePoint placed the site to read-only mode. However, all options under "Site Collection Quotas and Locks" were disabled in SharePoint 2013 Central Administration site!